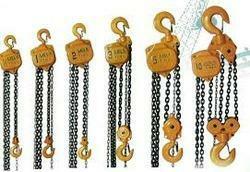 Our firm is providing an extensive range of Chain Pulley Block. In addition, we present this range to our customers in different patterns at affordable prices. Established in 2014, Raj Lifting Electric & Hardware has gained an admirable position in manufacturer, wholesaler and trader a wide range of Cable Trays, Support Channel, Power Cable, Wire Ropes, Electric Hoist etc. In addition, in order to present the reliable products, these products are checked on varied industry parameters and parameters. Our products are extremely used in the market for their top features.